Recent headlines touting a budding rebound in U.S. car sales should not be celebrated. The much lauded 17.5-million-unit figure reported for March auto sales was actually buoyed by fleet sales, which rose to a two-year high. Retail auto sales – a pure reflection of cars sold to individuals – fell 4 percent in March and by the same amount for the first quarter, according to Cox Automotive. Even after accounting for seasonal factors such as which period had more selling days, the data paint a bleak picture of consumer spending, which isn’t likely to get any better given the trends we are seeing this tax season. Internal Revenue Service data show tax refunds are down 4.1 percent over 2018, and the strategists at UBS AG estimate refunds will be $25 billion lower than they’d initially estimated this year. Although the Tax Cuts and Jobs Act enacted in late 2017 increased take-home pay somewhat last year, millions of households nevertheless treat tax refund season as a built-in component of their annual budget. Whether it’s that summer vacation, the family room face lift, or yes, that down payment on a new set of wheels – the tax refund proceeds are the planned funding source. And consider that at the same time refunds are down, gasoline prices are up by about 50 cents a gallon from their 2019 lows, equating to a $65 billion de facto tax on households. It’s no exaggeration to say that there are few risks to the global economy more daunting than a persistent slowdown in U.S. consumer spending. At 17 percent, U.S. consumption’s contribution to global gross domestic product eclipses that of the 16 percent attributable to the entire Chinese economy, according to Deutsche Bank AG. Black Knight data show that February and March mark the high points of the calendar year in which mortgage delinquencies decline due to tax refunds helping homeowners catch up on their payments. It’s probably no coincidence that mortgage delinquencies rose this February for the first time in 12 years. There's evidence that consumers looking to bolster their finances are turning to their homes increasing numbers. Tappable home equity peaked has fallen by $348 billion since peaking at $6.06 trillion in the second quarter of 2018, with $229 billion of the decline occurring in the fourth quarter as the housing slowdown deepened. Refinancing activity is up 43 percent over last year. The implications for the auto industry are twofold. 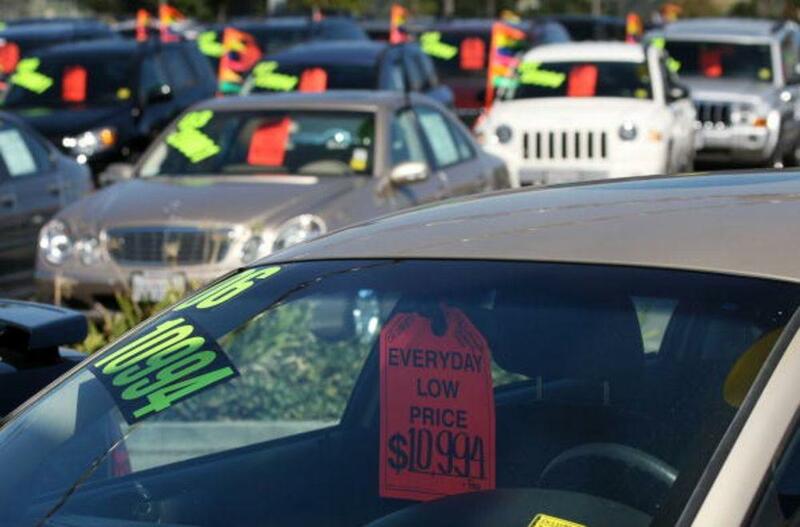 April retail car sales are unlikely to rebound as tax bills hit household budgets. This one month of added strain will likely be the proverbial hair that breaks the camel’s back. According to Ward’s, auto inventories have already piled up to the extent production cuts of 4.2 percent were pushed through in February. “If demand does not make a sharp upturn, there will have to be some paring of dealer stocks through a combination of higher retail spiffs or production cuts, Ward's noted in a March 4 report. The strain of inventories is increased further by the weakness in car sales in China, the world’s largest market since 2009. In 2018, Chinese car sales rang in at roughly 28 million units, compared with about 17 million in the U.S. As was the case with retail sales in the U.S., 2018 marked the first year of falling Chinese sales in decades. According to Xinhua, China’s state-run media outlet, car sales fell 12 percent in March from a year earlier, the 10th straight monthly decline. Add it all up and the celebration of last week’s auto sales should be short-lived. 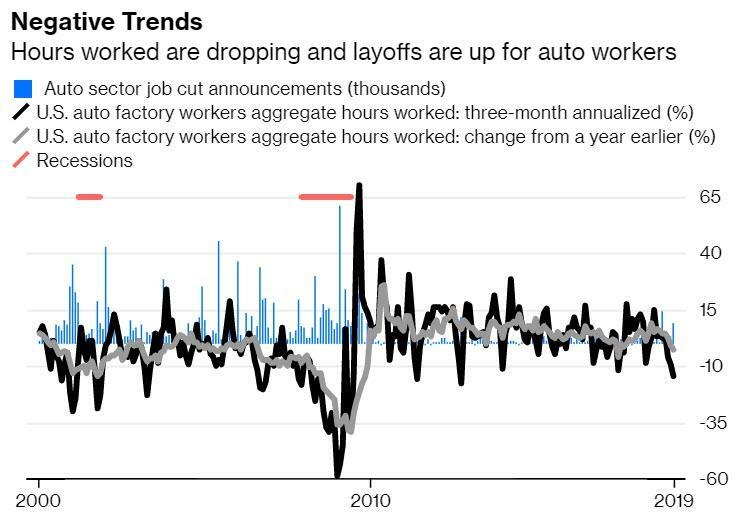 Auto factory workers are already working 2.5 percent fewer hours than they were at this point last year, a trend that’s accelerated to an annualized pace of 14.3 percent in the last three months. When cutting hours doesn’t do the trick, layoffs kick in. According to Challenger, Gray and Christmas, auto layoffs are third only to the beleaguered retail sector and industrials this year. The only production that looks to be increasing is that of pink slips in a sector that’s led growth in the current recovery, a development that will weigh further on U.S. spending even as consumption’s contribution to GDP has slipped to a year low. It’s likely the world economy is woefully unprepared.